The record labels are in VERY decent order indeed (see pictures) with NO stickers, NO tears, NO wear (apart from a TINY 'touched in' trace around the centre holes), NO writing, and only some spindle markings to either label!!!! The vinyl is in BRILLIANT condition!!!! Most of these 60s LPs had been to a lot of wild parties and are usually found totally worn out, and almost unplayable. This one is NOT and has NO nasty concentric marks AT ALL, only 3 or 4 TINY hairlines, only 3 or 4 VERY light scufflines, and only a VERYfew of the lightestpaper scuffs only visible under light!!!! THE RECORD STILL RETAINS ITS ORIGINAL 'JUST PRESSED' LOOK!!!! It is alsogreat to find that the record plays as STUNNINGLYas the visual with NO skips, only a few VERY light clicks (though mostly NONE! ), NO sticking, NO jumps, barely ANY crackle AT ALL, and only some VERY low level background sound on the run on grooves & gaps - NOT in the music AT ALL!!!! The sound quality is simply SUPERB - with barely ANY distortion and NO groovewear either!!!! The record must grade Very Good+ if notbetter!!!! Believe me this record is NOT overgraded in ANY way!!!! I use STRICT RC grading standards - it is not in my interest not to!!!! Brillant!!!! 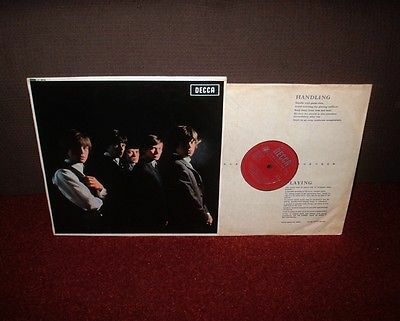 The record alsocomes in its ORIGINAL 1st Press'Handling/Playing' inner sleeve which is in SUPERB condition!!! !The ORIGINAL 1st Press 'MacNeill' Flipback LaminatedCover is in GREAT condition - and is a very VERY decent example indeed!!!! The cover has NO edge wear, NO spinal wear, only VERY slight corner wear (NOT through the colour! ), NO rips, NO tears, only a few VERYlight creases(cover is VERY flat looking! ), VERY shiny laminate (apart from the usual very VERY minor record impression! ), NO splits, NO annotations, and NO writing!!!! The opening edge isbeautifully straight with barely ANY feathering AT ALL!!!! Even the unlaminated back of the coveris in BRILLIANT condition with NO yellowing, NO grubbyness,NO ringwear, barely ANY rubbing AT ALL, andNO writing!!!! Thecover must gradeVery Good+ if not better!!!! THERE IS ABSOLUTELY NO DOUBTAT ALL, THAT THIS IS ONE OF THE ALL TIME RAREST ROLLING STONES LPs ANYWHERE IN THE WORLD TODAY (WITH THE WITHDRAWN '2.52' WRONG VERSION OF 'TELL ME'!)!!!! THISLP IS SERIOUSLY RARE AND VIRTUALLY IMPOSSIBLE TO LOCATE - SO DONT MISS OUT ON THIS INCREDIBLE OPPORTUNITY!!! !